New research has led to a warning from a leading Antarctic expert that the world is on track for massive sea level rises resulting from the melting of an ice sheet. The research, involving Victoria University of Wellington scientists, has revealed that if carbon dioxide levels in the atmosphere continue increasing as predicted, the giant East Antarctic ice sheet will melt. "Our study shows that this ice sheet becomes unstable and melts if carbon dioxide levels in the atmosphere reach 600 parts per million—levels which may be reached by the end of the century if emissions reductions targets agreed to recently in Paris are not met," says Professor Tim Naish, Director of Victoria University's Antarctic Research Centre. "If the Antarctic ice sheet completely melted, global sea level would rise about 60 metres. It's a sleeping giant." The research, published this week in prestigious international journal Science, documents the growth of the first continent-wide ice sheet on Antarctica 34 million years ago. Led by Italian scientist Professor Simone Galeotti from the University of Urbino, the research is based on geological drill cores taken from the Ross Sea near New Zealand's Scott Base 16 years ago by the international Cape Roberts Drilling Project. "The drill cores show that the first Antarctic ice sheet was quite dynamic. It advanced and retreated many times between 34 to 35 million years ago before finally stabilising at its largest extent when atmospheric carbon dioxide levels dropped below a threshold of 600 parts per million," says Professor Naish, who participated in the original drill core expedition and is a lead author on the paper. With carbon dioxide levels already at 400 parts per million and predicted to go higher, this study provides valuable insights into the potential future stability of the Antarctic ice sheet. "We know that parts of the ice sheet sitting below sea-level in West Antarctica are already melting in response to current global warming, but the much larger East Antarctic ice sheet, which sits mostly on rock above sea-level, was thought to be more stable," says Professor Naish. "We found it is vulnerable, and was much smaller the last time atmospheric carbon dioxide levels matched those predicted before the end of the century." The research also provides the first direct evidence that ice expanded all the way to the coast and out into the ocean, causing erosion of the seabed. Victoria's Emeritus Professor Peter Barrett, also an author on the study, was the project's Chief Scientist. The researchers cored through 1500 metres of sedimentary strata beneath the seafloor between October 1997 and December 1999, capturing Antarctic ice margin history from 35 to 17 million years ago. "It's great to see these geological archives, recovered by New Zealand's pioneering 1990s drilling technology, continuing to provide important new insights into how Antarctica is affected by climate change," says Professor Barrett. By the end of the century, a lot of things could happen. Hard to extrapolate to that distance. If it only goes to 599 ppm, we're good, right??? While it would be unfortunate to reshape coastlines around the world, at least it should happen at a slow enough rate to not endanger people. There would be many islands that would no longer exist. By then maybe we will have floating cities and it will be a non-issue. Ice sheets are extensive areas of *floating* ice: the melting of floating ice does not change the level of the water it is floating in. Glaciers flowing and or melting into the sea can raise the sea level. These guys must be claiming that the melting of this ice sheet will increase the rate of glacier advance in some way,or they are talking nonsense. It's beyond amusing, that despite all the claims of global warming, the only place they can find melting is in the West Antarctic, over known geothermal activity and in the east the ice is actually growing. hemitite - you do know that warmer liquid water takes up more space then colder liquid water right? Also the East Antarctic ice sheet sits ABOVE the water on rock. If this melts it will go down into the water. "What we need now is a confirmation of the findings of the paper from oceanographic data, because it is one thing to find potential pathways for warm water to intrude the cavity, it is another to show that this is actually happening", observes Eric Rignot, an Antarctica expert at the University of California, Irvine. "This paper comes short of the latter"
Wait, how do we know Antarctica even exists? It was probably invented by greedy explorers in the 18th century as a scam to enrich themselves on research grants. Have you ever wondered why so many early polar explorers died? They must have the honest ones who refused to go along! They had to be stopped before they talked, so they vanished on "heroic expeditions". Then cunning map makers cashed in by making all the old maps "obsolete" so people had to buy new ones. And school children have been indoctrinated with the fake maps ever since. 20th century aviators and space agencies knew a cash cow when they saw it and tricked governments into funding expensive "Antarctic bases" and satellites. If NASA could fake the Moon landings, they could EASILY fake an extra continent!!! There's probably nothing down there but water! And all those scientists working on "Antarctic bases" are probably sipping margaritas on some tropical island while the cash rolls in. WAIT!! What's that echo only you can hear?? Now, if only you had a brain, you'd realize it's sound entering your ears and bouncing around in the empty space between them. Thanks for playing. Now run along and don't forget to keep bouncing your head on the walls, that really enhances the echo the way you like. It doesn't have to melt to be a problem, all it has to do is slip. Another 'we're all gonna die' article if we don't impose an authoritarian world government and crap on the prols lifestyle. I've been reading this drek for the last 40 years and the apocalyptic disaster is always 10-20 years out. Strangely, when the predicted time arrives, we're still alive doing just fine and said predictions are memory-holed. Then of course a new apocalyptic disaster is announced. It's like these tools have an agenda or something. the article doesn't even mention the word "government" once! so what are you on about? And actually the piri reis map, which was created before the continent was 'discovered', shows a detailed shoreline. This map was drawn up back during a time when superstitious dogmatists were conjuring up all sorts of things. Not like today of course. If only physorg had made that lie the opening sentence, it would have saved me precious minutes reading this garbage. You're right, the cartographers and explorers must have been working together from the start!!!! And now the UN and climate scientists are in on it too. Liberals and atheists will stop at NOTHING to establish AUTHORITARIAN ONE WORLD GOVERNMENT!! WAKE UP PEOPLE, those "research grants" are FUNDING THE TAKEOVER and bankrupting the taxpayers!!! Firstly, Zorcon, that was epic. I loved it. But... it is 2016. Why are we still having to explain the basic differences between land and sea ice on every single damn article? If you don't know the difference between land and sea ice and why the East and West Antarctic are responding differently to climate change and why that response is different to the Arctic - then why are you even here making dumb comments on science articles? That doesn't apply to you anti - we all know why you're here making dumb comments on science articles. "However, above Antarctica the top-of-atmosphere (TOA) spectra look different; the spectra yield a maximum in the CO2 band [Thomas and Stamnes, 1999, Figure 1.2c]. This observation is consistent with the finding that in the interior of the Antarctic continent the surface is often colder than the stratosphere; therefore, the emission from the stratospheric CO2 is higher than the emission from the surface." How increasing CO2 leads to an increased negative greenhouse effect in Antarctica. Professor Tim Naish, Director of Victoria University's Antarctic Research Centre. Sea ice has to float. 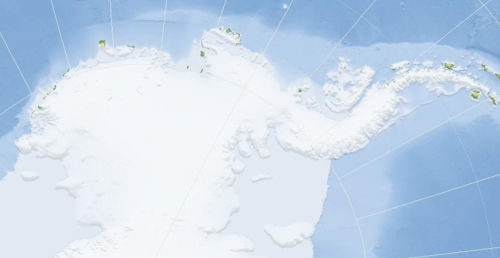 The West Antarctic ice sheet does not float. I think the intermediate form, ice resting on below sea level bedrock, will have to be explained every time. It's an interesting distinction, definitely. NASA refers to the West Antarctic ice sheet as a "frozen Hawaii with penguins" because it's a series of island covered by ice. Nonetheless, this article is about the East and that is land ice. So watching endless comments about how melting ice can't contribute to sea levels is frustrating. If East Antarctica melts, it could raise sea levels by 60m metres. Obviously that's going to be a slow process but sea levels could rise very fast if it became unstable. "It is important to note that these results do not contradict the key statements of the Intergovernmental Panel on Climate Change (IPCC) [Solomon et al., 2007; Ramaswamy et al., 2001; IPCC, 2013], namely, the well-known warming effect that CO2 has on the Earth's climate. Yet we showed that for the cold Antarctic continent some care needs to be taken when discussing the direct warming effect of CO2." How much will the ice melt, when average temperature is -55 deg C on the high plateau, and it gets colder with increased CO2? And the average temperature on lower plateaus is -28 deg C, and it will not change that much with increased CO2. So my point is, Professor Tim Naish: How shall you wake up the deeply frozen giant? "If the Antarctic ice sheet completely melted, global sea level would rise about 60 metres. It's a sleeping giant." But a nice title for the next cathastrophic movie (but not for a serious article). "But it might only take a few decades for Antarctica's growth to reverse, according to Zwally. "If the losses of the Antarctic Peninsula and parts of West Antarctica continue to increase at the same rate they've been increasing for the last two decades, the losses will catch up with the long-term gain in East Antarctica in 20 or 30 years -- I don't think there will be enough snowfall increase to offset these losses." [And actually the piri reis map, which was created before the continent was 'discovered', shows a detailed shoreline. Since we are still coming off the last ice age and haven't reached peak temps, it makes sense. Yah and I hear their new capital city will be in antarctica. "Amundsen City is the proposed capital city for the state of Amundsen. Located ... Federated States of Antarctica..."